Some of my readers may know that Nightwish is one of my absolute favorite bands. Hailing from Finland and Sweden, Nightwish plays symphonic metal/rock, which means catchy tunes with plenty of emotion and sweeping orchestral sounds, the band has been constantly evolving since its founding in 1996. The band, which consists of vocalist Anette Olzon, guitarist Emppu Vuorinen, bassist/vocalist Marco Hietala, keyboardist and composer Tuomas Holopainen and drummer Jukka Nevalainen, has released seven albums and several EPs. Anette is a recent replacement for Tarja Turunen, whose operatic vocals made the band famous. Thus her firing from the band in 2005 created a divide among the large fan base as to whether Tarja’s operatic vocals were superior to Anette’s pop/rock voice. Imaginaerum is Anette’s second album with the band, which comes four years after Dark Passion Play, which went platinum in many European countries and was the band’s biggest commercial success to date. Imaginaerum, the focus of this review, is a rather mixed bag that fails to hold up to some of the band’s earlier fantastic works. The album deals with the story in a much more abstract manner and seems to deal more with the internal experiences and emotions of the characters rather than carrying on the plot of the film. I await the film eagerly and hope it will be released in the U.S, and had eagerly awaited the album for the past several years. The album, like its predecessor, is thirteen tracks of epic bombast and emotion, with grand orchestral interludes and several songs that grab hold of you and stay in your mind. Nightwish’s usual lyrical themes of childhood innocence and longing for love and beauty are omnipresent. However, too much of the album falls prey to trying too hard to achieve a creepy, scary effect, rendering some of the songs mediocre and laughable. Such flaws prevent Imaginaerum from being Nightwish’s greatest achievement. When the album works, it is an otherworldly experience, a rollercoaster ride through dreams and nightmares that gets the heart pounding. Much of the album’s success is due to the fantastic orchestral arrangements by Pip Williams, who arranged the orchestras for Nightwish’s past several albums. Pip’s arrangements add a sense of wonder and depth and grandeur to songs that might sound simple and bare. Melodic themes run throughout the album and are referenced in other songs, adding a sense of musical unity. The opening track, an all-Finnish introduction called “Taikatalvi”, which roughly translates to “Magic Winter”, is a gentle orchestral piece with soothing crooning from Marco. The song builds and swells wonderfully as Marco’s accompaniment grows from a simple music box sounds to include Tuomas’ lovely piano, a welcome addition, and flutes and strings. “Taikatalvi” leads directly into the lead single, “Storytime”. “Storytime” is an example of classic Nightwish, with heavy guitars and a sing-along chorus that has an excellent and exciting orchestral and choral passage. “Storytime”, like “Taikatalvi”, also makes good use of Tuomas’ keys, which recently have been drowned in the mixing of previous albums, and Marco’s bass is audible for parts of the introduction! “Ghost River” is outstanding musically and recalls songs from Nightwish’s earlier classics Century Child and Once. The song opens with a great guitar riff and features Anette and Marco duetting powerfully. Anette’s sweet, emotional, malleable voice serves the music perfectly. Marco’s gruff yells complement her perfectly. The song is most similar to Nightwish’s past tracks “Dead to the World” and cover of “The Phantom of the Opera”. The strong playing from the entire band is enhanced by the spot-on arrangements and use of a children’s choir to add to the creepy effect of a river of nightmares and dreams. “Ghost River” is a perfect example of how Nightwish can blend its past and future perfectly in one song and it is an absolute standout on the album. “I Want My Tears Back”, despite the cheesy title, is another excellent track where Anette and Marco duet. Tuomas has a definite knack for writing incredibly choruses, and “I Want My Tears Back” is no exception. It resembles “Bye Bye Beautiful” from Dark Passion Play, although lyrically it has replaced the scathing critique of Tarja with longing for childhood stories and magic that disappears when one grows up. “Slow, Love, Slow” is a completely new style of song for Nightwish. It is not metal, rock or pop, but is a slow jazzy ballad. It opens with a beautiful melancholy piano and features Anette crooning as if she’s lying on a piano in a smoky bar. Nightwish is brave for trying something so radically different. The other two ballads, “Turn Lose the Mermaids” and “The Crow, the Owl, and the Dove”, are beautiful, acoustic folk-inspired songs. “The Crow, the Owl, and the Dove”, composed by Marco, is an excellent ballad that features Anette singing not only with Marco but also with guest musician Troy Donockley, who played the uilleann pipes on Dark Passion Play and on this album as well. The lyrics of “The Crow…” are pensive, meditative and thoughtful and possibly the best on the album. Anette shines best when singing acoustic ballads, as she does not risk being drowned out by heavy guitars, and shows off her excellent sweet mid-range vocals. As the replacement for the fanatically beloved Tarja, Anette faces much criticism for her vocals, but she is one of the most consistently strong elements on this album. “Scaretale” is a creepy nightmare of a song with an amazing metal and orchestral introduction and excellently strong music and appropriately fairy-tale scary lyrics. The instrumental songs, “Arabesque” and “Imaginaerum” strongly feature Pip Williams’ skill. The latter song, the closing song of the album, is meant to be the music for the end credits of the film and wonderfully combines all the themes and melodies of nearly every song on the album into a stunning end. The album also features a thirteen minute-long track, “Song of Myself”, which combines Tuomas’ melancholy lyrical themes with Walt-Whitman inspired passages. The first six minutes of the song, with its powerful chorus and bridge, accompanied by haunting choirs, rival “The Poet and the Pendulum”, the opus of Dark Passion Play. “Rest Calm” is another duet between Marco and Anette that switches tempos and moods, from heavy to acoustic, and gradually builds towards the end with the swelling orchestra. A true highlight of the album is “Last Ride of the Day”, which is also quintessential Nightwish, opening grandly with an imposing orchestral and choral passage that is joined by heavy guitars, building up to a rousing, ecstatic chorus. In this song the marriage between the metal band and symphony orchestra is a true success and this song, along with “Ghost River” and “The Crow, the Owl, and the Dove”, are the best songs of the album. I wanted to love Imaginaerum completely. I had been following every scrap of news regarding the album for over two years. Unfortunately, I had impossibly high expectations that the updates from the band fed. Logically, no album could have satisfied my hopes. For all its excellent moments, Imaginaerum has some disappointing elements that make the overall impression weaker than the individual songs. Thirteen songs may seem like a lot, but when two are instrumentals, one is a short intro, and the latter half of the central pivotal track falls flat, the overall album seems more show and less actual substance and the actual amount of interesting content is precious and rare. The lyrics as a whole on this album have a sense of laziness and fatigue and are content to rehash old themes from older material rather than break any new emotional or lyrical ground. “Storytime”, while catchy, is leagues behind “Nemo” and “Amaranth”, the lead singles from Once and Dark Passion Play, respectively, in terms of emotional power and/or replay value. Anette’s voice is childish and weak on this track, although that flaw and her other vocal missteps may be explained by her fractured rib, suffered too soon before the recording dates. 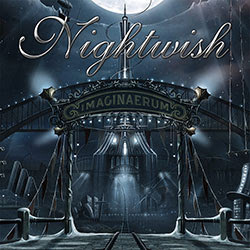 This album is the first Nightwish album written with Anette’s voice in mind, yet Tuomas insists on making her sing less in her excellent midrange and more in her less confident and polished higher range. In addition, he directs her to stifle her voice by having her occasionally whisper-sing, which sounds childish and does not show off her talents. “Storytime” just doesn’t have the same magic that Nightwish singles are notable for. “Ghost River”, for all its musical excellence, suffers from clichéd “metal” lyrics about death and nightmares. “Slow, Love, Slow”, the unique jazzy number, drags on for too long. “I Want My Tears Back”, while incredibly catchy and infectious, makes too much use of the uilleann pipes and bagpipes, courtesy of Troy Donockley, that are not pleasant to listen to. The Celtic elements that Nightwish has gradually incorporated into this album and its predecessor are hit-or-miss. In this song they are a miss and do not really add anything except for a headache. Scaretale is one of multiple songs on the album that begins spectacularly and ends badly. It opens with engaging instrumentals, and then Anette begins to imitate an evil witch straight out of a storybook. It is a good attempt, but she sounds less scary and more laughable. The rest of the song features a comically bad announcer who is meant to give the song a scary circus-like feel. Overall the song is disappointing. The instrumental “Arabesque”, while lovely, is pure filler. “Rest Calm” is also filler and doesn’t really stand out in any way, as a typical mid-tempo Nightwish song. “Turn Loose the Mermaids” tries to play up its Celtic charm too much, with Anette adopting some strange vocal mannerisms that make her sound annoying. The song is cutesy and is not moving as it tries to be. “Song of Myself” is the greatest disappointment of the album. It opens spectacularly, like a sequel to “The Poet and the Pendulum”. However, from the fast-paced and thrilling first six minutes, the final half of the song devolves into seven minutes of spoken poetry that completely loses the attention of the listener. Spoken word is fine, but not for seven minutes of a thirteen-minute opus. It makes “Song of Myself” seem as if it should have been two songs, because the music of the first half is not reintroduced in the second half. The two pieces feel disjointed. The song starts off wonderfully but strangles its own success. In addition, the decrease in pride and in quality of the band members’ playing is notable. Emppu has maybe three guitar parts in the whole album that show off his skill, Jukka never gets to show off his drum-playing abilities like he did in 1998’s Oceanborn, and Marco’s bass is almost always inaudible. The orchestra drowns out nearly everything but the heaviest, most basic guitar chugging. Tuomas’ keys are placed better in the mix, however, and he has some nice, if simple, parts. Passages that could easily have been handled by the band members are instead delegated to the orchestra, which seems to have become a permanent fixture in the band’s albums. Imaginaerum could have been Nightwish’s greatest artistic achievement. No doubt it will become their greatest commercial success. The album has an interesting concept and many incredible moments, but is weighed down by too much mediocrity in too many places for it to truly soar. Your review does a great job of letting listeners get a feel for what to expect. While this is not really my favorite genre of music, I have listened to previous tracks after reading about the group here. I will now listen to some of the tracks you suggest on this release and get back to you! You have done a great in-depth review here. I like the way you present both sides of the story so that readers (and listeners) know that you are not simply applauding the album but truly reviewing it. Great work!